I have had a few experiences with SP as a teenager but never frequent enough to really cause me to notice. Most of my unusual dreams at the time had more to do with flying experiences. But, over the past few years it has been slowly increasing. Now I am 32 years old and I have episodes very often. Sometimes as much as 3-4 times a night for 1-2 week straight. Then it usually subsides for a few weeks and then back again with the same frequency. I have also noticed that it usually happens at the same time. Most of the time it does only happen when I am lying on my back, which I was able to control, but now it happens when I am sleeping on my side as well. My experience is usually the same. I wake up with blurry vision but I am able to make out my surroundings. I am completely unable to move or speak. I try to get out nose and rock to "snap" my self out of it. I usually hope my husband comes in the room to rescue me, since it usually happens when he is getting ready for work. I have many times thought he had come into the room and walks over to me and wakes me of I have crawled struggling out of the room to him. Only to find myself "really" wake up, still in bed with him still showering or in the bed next to me. During my SP I usually have a sense of panic, sometimes see figures or people in the room that are not there when I come out of it. I sleep on the left side of the bed and I usually sense a presence next to me on the side on me. But, lately I sense another coming for the other side as well. Sometimes I see a small crippled like black hand coming toward my chest. I try really hard to fight it because I feel that if I dont, I will die. When I try to relax and go with it I see vivid flashes of light and start to hear voices. When I wake I am very tired, but if I go right back to sleep, it will most likely happen again within a few minutes. Because of the increased frequency, I am trying to figure out more and possible ways to prevent this. Although, sometimes I do wonder if it is some sort of "gift". I wonder if there is some sort of link to hormones and my menstrual cycle. Has anyone realized anything like that. Kevin: Hey Courtney, thanks a bunch for sharing your experience. 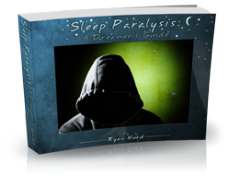 For finding a way to prevent the increased frequency of your SP episodes I'd recommend reading Ryan Hurd's book Sleep Paralysis: A Dreamer's Guide, which you can find my review of here. I'm by no means a expert but I can certainly relate to your problem having had the same experiences. I believe your sleep paralysis also involves Hypnagogic Hallucinations. (the dreams or visions you experience between sleep and wakefulness) I don't experience them nearly as often as you do. I'll become aware that I can't move while having the worst nightmares you can imagine. Sometimes my eyes are open and I can see the ceiling above me. Unfortunatly my dreams, visions or whatever are always on the dark side. Until the SP ends I am stuck there in terror and unable to do a damn thing about it. I wake up sweating and shaking. I'm not trying to scare you by my extreme case. I know people who have no dreams or just see colors who find it no more than an annoyance. I'm so sorry your going through this. I can't offer any help in stopping it but I did want you to know your not alone and your not going crazy. If you have not yet click on that link that Kevin provided. I hope everything goes well for you. -A too-warm body temperature. If I'm sleeping with a really warm thermal blanket, or a lot of blankets in the warm daytime, it's almost guaranteed I will experience SP. I now like to leave my feet uncovered and don't use fuzzy warm blankets so that my body temperature stays low. Almost invariably I feel "too hot" when I wake from sleep paralysis. -Irregular sleep patterns. If I fall asleep earlier than usual (9pm instead of my normal 11:30) I'm more likely to wake up in the middle of the night with SP. 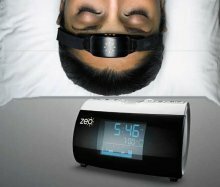 Sleeping in late in the day, naps, or really any sort of unusual sleep activity seems to cause it to happen. Unless I'm super tired, I avoid naps at all costs. One thing that helped me is keeping a diary of my SP so that I could identify common triggers (time of day/night, had I been drinking that evening, etc). I have no idea if these causes/triggers have been experienced by others, but maybe you'll be able to identify them more readily now if they affect you. Hope it helps!